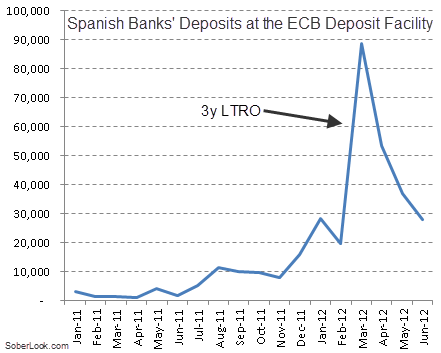 The flight of capital out of Spain can be seen in the deposits held by Spanish banks at the ECB Deposit Facility. Right after the 3-year LTRO program, Spain's banks had significant excess reserves. Those reserves rapidly declined as capital left the country. Given that the overall Deposit Facility has been fairly static, excess reserves for other banks in the Eurosystem have gone up. Going forward these banks (in the Eurozone "core") will be turning away periphery depositors (or charging them for holding cash) because the ECB facility no longer pays interest. Moving deposits out of Spain has become more difficult. See this link for the latest Banks of Spain balance sheet figures (h/t Kostas Kalevras).